1 set of 4 EasyLunchboxes and a Cooler Bag: These are the dependable, everyday lunch box containers that we’ve used for YEARS. I love that they come in a set of four, so there’s always one that’s clean (and that they’re dishwasher safe). 1 U Konserve Insulated Food Jar: This is the thermos we use to send in everything from soup to leftover Chinese take-out. 1 set of U Konserve Stainless Steel Containers: These are great for snacks and sides and can withstand lots of backpack abuse. 1 Genuine Thermos Brand Funtainer Water Bottle: We’ve owned a lot of water bottles, but this is one of the best at keeping water cold all day at school. It’s also super durable (my third grader is still using his Funtainer from kindergarten). The winner will get to choose from a variety of colors and designs. 1 set of Personalized Mini Labels from Label Land: These truly stay stuck to water bottles, lunch boxes, and even backpacks, and they’re 100% waterproof. 2 sets of (re)zip Reusable Bags (sandwich & snack size): These leakproof, reusable bags replace all those disposable plastic baggies for sandwiches, sides, and snacks. They’re BPA-free and freezer-safe too. Coupons for Applegate Meat & Cheese: Applegate has a variety of sandwich staples including turkey, ham, roast beef, and assorted cheese–and all of their products come from animals raised humanely and never given hormones or antibiotics. Coupons for Stonyfield YoKids Yogurt: Stonyfield makes kids’ yogurts in cups, squeeze pouches, and tubes. It’s all organic, non-GMO, and of contains no artificial stuff. 12 Stemilt Gala Apples: Crisp and sweet and perfect for packing in lunch boxes and backpacks. To enter, leave a comment telling me something you like to pack in your child’s lunch. **This giveaway is now closed. Thanks to everyone for entering! ** The giveaway will end Tuesday August 23 at noon Eastern Time and the winner will be chosen at random (U.S. residents only please). Disclosure: I’m happy to be working with Applegate, Stonyfield, and Stemilt this year, but I wasn’t compensated for including them in this giveaway. Thank you to ALL the brands who are participating! I like to pack mini “pizzas” in my son’s lunch box: small pitas, Applegate turkey pepperoni, and slices of mozzarella cheese. When his friends are eating Lunchables, he feels cool too – but without all that super processed junk. I throw in some carrot sticks, some grapes, and a drink (and maybe a cookie! ), and I feel good about what I’m sending him with! I love this! So many ideas!!! I love to pack apples that have been soaked in oj. Got that idea from you, Sally! Thanks for all the tips!!! Sunflower seeds and dried cranberries! Turkey roll ups, no bake peanut butter energy ballls, chips and salsa, veggie sticks. I like to pack bento box style lunches with little bites of protein, fruit, veggies, and starches. The kids really like it! My girls love when I bake them mini muffins to take. They don’t want full sized muffins though…just mini. Pizza on whole wheat naan bread (sometimes with veggies), and quesadillas on corn tortillas. Thanks for the opp to win so many great goodies! MY kids love the frozen yogurt tubes in their lunch. Cheese, pretzels, and cut up peppers are staples for my kids. My kids love dinner leftovers way more than any sandwich I create. As a child, my favorite things my mother would pack in my own school lunch bag were summer sausage and cheese, peanut butter and apples, and goldfish crackers. That’s what I like to pack in any lunch box, kid or adult! The more fresh fruit and veggies I can get into their lunches, the better. Not always easy and they don’t always eat it, but I try. We do a lot of pb&j for my son. Today I had the idea to cut up a pb&j into pieces and put each piece on a toothpick. I gave half of the pieces to each of my daughters. Neither one likes pb&j normally, but both were interested in these. Always happy to find anything to add in the lunch rotation! I like to pack homemade lunchables- crackers, small slices of meat & cheese. I always pack nuts or nut butter in my child’s lunchbox. Me, me, me!! Love your blog…from one dietitian to another. Thank you. I love to pack fruit and yogurt for my kiddo. He loves when I treat him to organic chocolate milk on special occasions! He would love to have this thermos for his Ninja turtle lunchbox!! StonyField yogurt is a must! I know that it will be gone if it’s packed in there! I like to pack a note in my kids lunch so they know I’m thinking of them while they’re at school! Will do it until they want me to stop! My favorite thing to pack are homemade Lara bars. Not processed. I also put homemade zucchini muffins or lemon blueberry muffins and carrot sticks. My son loves it! My kids love cheese and crackers for lunch! And my youngest loves soup. I like to pack frozen grapes. They keep the rest of the items in the lunchbox cool and are a healthy sweet treat. My favorite think to pack her is note, joke, fact or just a doodle…..and the times I forget she will notice it 🙂 actual food will depend on the time of the year and what she wants to eat. I like to pack something homemade most days, like a muffin or bread from my bread maker in their sandwich. But I’ve learned to give myself slack as a working mom and know that might not always be possible and a granola bar or peanut butter crackers will get eaten just as heartily, if not more! I’ll be honest, my kids eat leftovers almost everyday for lunch. It makes it easier to just pack up dinner leftovers into lunch containers for the next day. Bento box style, turkey and cheese, crackers, fruit, trail mix or a peanut butter cup as a treat. My oldest will eat anything in his lunch box. From chili, roasted broccoli, to sandwiches and wraps he will eat and enjoy it all. My 7 year old will ONLY eat peanut butter and jelly in his lunch box. He will devour all the fruits and veggies I can fit in his lunch box, though he does like it when I add grapes and strawberries. Pb&j on whole wheat, yogurt, fruit, veggies, and milk from school. My son thinks it’s a treat to bring his own lunch! love reading all the suggestions, carrots and hummus! peanut butter and jelly sandwich-classic. I like to pack hummus and pita bread, with nuts and fruit. Applegate meats and yogurt are staples in my kids’ lunches. I would love to win this! Our fall back is a good old PB&J, but often times it’s leftovers from dinner. Always a good mix of protein, whole grains, fruit, veg and a snack for the afternoon! My daughter loves fruit. So I love to pack her fresh fruit along with her sandwich and goodies. We like to pack breakfast for lunch–homemade mini muffins, fruit, smoothies, etc. I use a bent go kids bento box and it helps so much with lunch packing. Dinner leftovers! My daughter has an ice pack and is happy to eat them cold. (She has been known to portion out her lunch before we have dinner seconds to ensure she gets some for lunch). We love Mac N Cheese and chicken nuggets! Of course, some kind of fruit or veggie, too! Tortilla wraps with ham or turkey and spinach have been a hit with one of my kids. My little one loves roll-ups or torpedoes (his creative names): whole wheat tortilla/wrap with ham, cheese, whatever! What a great giveaway! My go-to packed lunch is cheddar cheese slices, triscuits, sliced apples, and sugar snap peas. Always a hit with my girls! My kids love crescent dogs and applesauce and their lunches ! Everything would be used for lunches. We try to have fruit, veggies, and change up the sandwiches. I love including hummus, then dip with peppers and crackers. We love to pack homemade lunchables, fresh fruit and hummus! 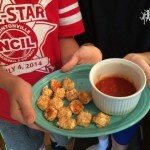 My kids love to take leftovers like chili or lasagna and homemade baked treats. Froozen natural applesauce pouches. No added sugar and works great as a cold pack until lunch time. Lately I’ve been packing a Mediterranean meal–veggies, whole-wheat pita, hummus, baba ganoush, and two olives as a treat. They love it! I like to pack pumpkin seeds in my son’s lunch! His school is nut and meat free so we have to get pretty creative. Some other things we like to pack are hard boiled eggs, raisins and a little tin of hot broccoli. We also love to pack diced peaches with a little sprinkle of cinnamon. We also stick to PBJ… Simple, but the kiddo’s fave! For snacks this week we’re doing Larabars and Annie’s crackers. i slice an apple and throw it in a ziplock with cinnamon and shake it up!! My boys and their friends love it! Best thing is it’s healthy and filling with no sugar! And if it turns brown they can’t tell because of the cinnamon! I also like to make homemade lunchables for my kids in their lunches. Plus veggies & little containers of ranch for dipping. Crackers, applegate uncured turkey pepperoni, baby bel cheese rounds, fresh fruit and a treat. I like to pack healthy versions of the store bought Lunchables. I also like to pack cut fruit and yogurt with fun things like mini chocolate chips mixed in. I asked my daughter (7) what her favorite things I pack in her lunch are and she enthusiastically exclaimed, “Olives! Olives! Olives! and,uh, spaghetti!”. I have way more time to make dinner in the early evenings than I do to pack a lunch the night before or in the morning so I love being able to use a thermos to send her with something healthy and filling for lunch. My daughter is a self-proclaimed vegetarian who isn’t the biggest fan of peanut butter so school lunches can be tricky! My son loves pepperoni, cheese & crackers! My daughters like to take refried beans on a thermos. I give them cheese or sour cream in a separate container. I like to pack the snack size Wholly Guacamole containers and organic corn chips or cucumbers and carrots. I try to switch it up every day, but I always make sure they have fresh fruit, some protein, a dairy, water, and a snack. Today’s lunch was turkey and mayo on white bread, strawberries, yogurt and yogurt-covered pretzels. My son is just starting junior kindergarten this September so I’m new to the packed lunch game. He’s super pumped about getting hard boiled eggs! Homemade lunchables, fresh fruit and hummus! I like to pack fresh fruits and veggies. Anything I can do for a healthy snack. My daughter loves mini bagels with cream cheese in her lunch. My son loves tortilla roll ups with applesauce, and raisins. Fresh berries are always a hit. Meat roll-ups, fresh fruit, veggies with a hummus dip! Thanks! My daughter loves strawberries and my son loves raspberries in their lunches. Homemade lunchables and frozen smoothies are my daughters favorites! I like to pack leftovers from our dinners like honey garlic chicken with noodles. My daughter loves French toast for lunch. I make it for her in the am while she’s having breakfast and cut it into slices for her. It’s her favorite. Then pair with fruits and veggies. Always comes home empty. I like making our own lunchables! They are a fun lunch for my kiddos! I do a lot of homemade lunchables. Leftovers! My kiddo doesn’t like sandwiches so I make a little extra dinner the night before. Warmed in s thermos or wrapped in a tortilla! My kids like a deconstructed salad bar kind of thing:. Veggies, deli meat, croutons, and of course some ranch to dip it all in! I like to pack Cutie oranges in their lunch box, and string cheese. I like to pack variety, but my 2nd grader prefers consistency, usually sunbutter and jelly sandwich on homemade bread and some fresh fruit. He eats more if I pack fewer items. This seems to be a similar (though less frustrating) phenomena to the fact that he wakes up earlier when he stays up late. 🙂 this giveaway ends on my birthday, so that would make it extra special! What a great giveaway! My girls love peanut or other nut butters with pretzel crackers as well as sliced strawberries to dip in the nut butters. They also like to have pluots, freeze-dried apple slices, or a clementine and a New Horizon individual size milk or water. For a special treat, I surprise them with a small handful of dark chocolate covered cranberries. I would like to branch out from just packing sandwiches for my kids’ lunch. I’m thinking that tacos would be fun to pack this year…or maybe one of them would be willing to try soup on a cold winter day. We pack hummus every time we pack lunch! My kids like mini pizzas (either English muffins or bagels) and homemade lunchables in their lunches. My son asked to take chicken and brown rice to school today in his new thermos. I love when I have ready-to-go food -leftovers, frozen homemade muffins, mini pizzas, and even frozen peas are a hit! Cheese sticks and fresh fruit are staples, as well. My daughter loves it when I pack cream cheese sandwiches or banana bread. This blog is one of my all time favorites! My boys live rotisserie chicken and strawberries for their lunch! Turkey, Banana Power muffins and cantaloupe! Whole wheat crackers and cheddar cheese are always a hit here. Hummus and veggies and pita chips. My oldest loves leftovers from dinner and fruits & veggies. My youngest loves bento style with a bunch of small different fruits, veggies and yogurt. We recently found some really yummy grass-fed beef jerky that my 3rd grader likes! Oh em gee. LOVE. I heart these and would feel like such an awesome chef mom! We make mini pizzas using whole wheat English muffins, turkey pepperoni, sauce and part skim cheese. One of her favorites! My little one loves warmed up rice and beans in her thermos! Some of my children’s favorite lunch items are: string cheese, wrap sandwiches, popcorn, veges and hummus, apples with peanut butter, homemade spelt pumpkin muffins, and yogurt. This will be my first year packing lunch but so far my son loves pepperoni sandwiches. I know it’s not the healthiest sandwich but he loves it. My daughter likes cheese, crackers and turkey and to make her own sandwiches from that with carrots and celery! And a treat of course! I enjoy packing soup for my guys in the colder months. It makes my heart happy knowing that they can have a little piece of home while they are at school. My kids love leftover soup in their lunches! I almost have to continually make batches of split pea (for my oldest) and minestrone (for my youngest) during the school year. Thermoses are a must! I like to pack pinwheels made from a wheat tortilla, lunch meat and salad mix. It makes for a tasty and visually appealing meal for my kiddo. Also, homemade lunchable-inspired meals. Mac and cheese in a thermos with mixed veggie assortment! My daughter is always begging for lunchables, so I’ve been making them for her with ingredients I can feel good about her eating. Her favorite is homemade dark chocolate pudding, rice crackers, Applegate salami, and cheese cut withe little cookie cutters. I always include a fruit and vegetable. Love your blog, I am a dietitian too! My daughter loves pita pizzas, apple sandwiches and anything baked in a muffin! I would love to win! My kids love apples and peanut butter and they also enjoy cold grapes when it’s hot outside. I always pack on fruit, one veggie and a sandwich. I send quinoa with corn, black beans and chicken. The container is always empty when my son gets home! She loves apples slices and cheese along with crackers- simple yet wholesome! My children don’t love sandwiches, so we do a lot of turkey rolls with fruit, cheese, granola….however our favorite is breakfast for lunch: oatmeal, fruit, granola/dry cereal and yogurt. So cool for back to school! My daughter love any homemade leftovers such as Mac and cheese, chicken stir fry, and bananna muffins. I don’t pack lunch for my two year old, but he just ate lentil sloppy joes in a tortilla with cauliflower and a plum. I actually have a teen I like to get food ready for. We usually do a shmorgous board of food from dinner the night before. Chicken and rice, spaghetti, etc. I also try to include a fruit, usually apple or banana and maybe string cheese or crackers. He eats a little different but I definitely try to make it healthy and clean for him. My kids like homemade mini muffins,fruit,veggie sticks and nuts. My kids love “snack lunches”…hummus or PB and crackers, cheese, salami, fruit and veggies. My son likes hummus with pretzel chips and veggies to dip, plus fresh fruit and cheese. 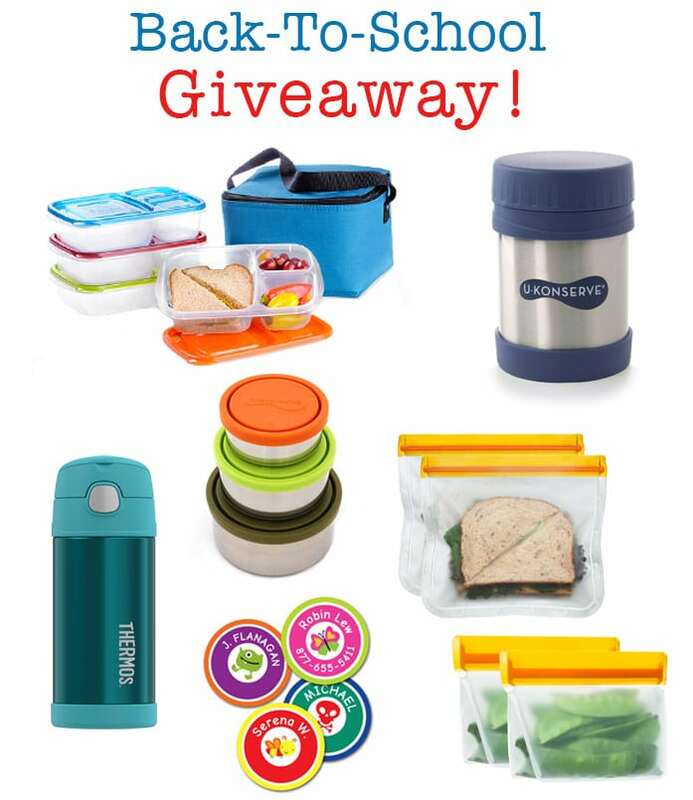 I love using our yumboxes to pack lunch but would love to try some of these things if I win! Thanks so much! I don’t have kids but I have neices and nephews I help with. The toddler just discovered he likes applesauce so that was great! My kids love homemade chicken noodle soup! We use the thermos hot food container and it works great! I send that with fruits, veggies, yogurt or cheese, and graham crackers. Ham & cheese quisadilla made on the flat top stove. My kids love when I pack breakfast-for-lunch! They especially enjoy waffles with some maple syrup to dip into! My three kiddos eat such a wide variety of food for dinner, that I am happy to accommodate their regular,repeated requests for school lunches. Our lunches almost always consist of a bagel with cream cheese or a PBJ, a fruit, a vegetable (or multiple veggies), crackers/chips/etc and then a special small dessert. I keep it simple, I keep it within their most favorite lunch items. They appreciate the consistency and I appreciate their branching out and trying lots of new and different meals at dinnertime! Quesadilla’s are something I pack when we get tired of sandwiches… Easy and delicious! I love to pack them homemade pumpkin or banana bread! Fresh veggies and fresh homemade popcorn! My toddler gets vegetables, fruit, and a peanut butter sandwich for lunch at the sitter! First, I LOVE that my kids are able to pack their own lunches!ESS stress for this mama. But, they love making little salads and yogurt! We’ve been packing lunches since kindergarten and are now entering the 4th!! We would love some help in packing the hundreds of lunches!! My son enjoys peeled hard boiled eggs! I keep a stash of salt packets from take out restaurants, and throw one in his lunch for easy salting. Please enter me! I love packing fresh fruit and mini kabobs on toothpicks! My kids love “sandwich sushi roll ups” and leftover “picadillo”. Always fruit too! Always fresh fruit. Pumpkin seeds or sunflower seeds. Nut butter and apple slices are a favorite here! Sugar snap peas and a sweet note! Fruits and vegetables. Chicken salad in whole wheat bread, turkey wrap and hard boiled egg. My daughter loves raviolis and blueberries in her lunches. Chicken nuggets are also a go-to! There is always fresh fruit! Leftovers in a thermos: pasta, rice w/veggies, soup, etc. I also pack homemade “Lunchables”. So quick and easy! My son is not in school yet, but when I pack lunch for him I always add some kind of fruit…which is his favorite anyways! PB&J and cheese/turkey roll ups are some of his favorites too! I cut celery across the stalk to make 1/3′ slices – then toss them into a container – they are easy to eat with no “string” issue – like chips!! My daughter’s favorite is whole grain organic pasta with home made tomato sauce. Thank you, it would be great to win! We do homemade lunchables a lot!! My kids love them and I don’t feel so bad about sending those! I love to leave a surprise like a homemade banana or blueberry muffin! Lots of fruit and homemade granola bars are a staple in our lunches. My kids don’t like sandwiches (except for PB&J) but they do like foods they can eat with their hands like tortellini, deli ham (not in a sandwich, though!) or string cheese and crackers. We always need to have one fruit, one vegetable and one dairy. Treats or chips only when I decide! I always pack a fruit, a vegetable and a little note. The note is a must. Everything else changes depending on the season and kiddo’s mood. I am looking forward to packing little notes in my daughter’s lunch box, even though she won’t be able to read them yet 🙂 Food wise, I’ll be packing her sunflower seed butter sandwiches, peas, sliced fruit, and homemade oatmeal chocolate chip cookies. Peanut butter sandwiches with jelly or honey, with fruit (like grapes) or a veggie (like red pepper slices). And milk or chocolate milk. If I pack much more than that it usually goes to waste! Turkey pinwheels, carrot sticks, cheese cubes or babybel, fresh fruit, yogurt-covered raisins…we like bento style lunches for my preschooler, and most days, her lunchbox is empty! I like to pack Bananas and write encouraging messages on the peel! One of my daughters favorites in her lunch is just a plain tortilla with peanut butter in it. Easy. Our boys love tortilla wraps with ham, pepper strips and lettuce! Thanks for the goodie offer! I like packing fresh veggies and I love when the bag comes home empty! My kids love Applegate turkey and Colby jack cheese roll ups with hummus and spinach, or apple, peanut butter honey sandwiches. Would love to win! Fresh fruit and dairy free cheese! My son loves almond butter on Triscuits! Hummus and Crackers…..always a fruit! Both of my boys love yogurt and applesauce so those are staples. Grapes and watermelon are favorites of my 6 year old. Mini pumpkin muffins and blueberries! I like to pack hardbouled eggs, carrots and celery with hummus. Turkey and cheese roll-ups, organic cheddar bunnies and fresh fruit with a thermos of water. My son loves homemade lunchables. Mini crackers, cheese, & meat. He also loves as much fruit as possible. The biggest hit and maybe the easiest lunch is the combo of mini pitas with pizza sauce and shredded mozzarella cheese! My girls think they are getting a huge treat, but it is so desperately easy! I am trying to get more creative. Usually a sandwich of some sort, yogurt parfait, trail mix, fruit, veggies and dip. We are all about the Bento box lunch. I usually add a raw veggie, fresh fruit, a sandwich (cut into a fun shape ), something salty (pretzels, chips) and something sweet like a homemade cookie. For picky eaters, their lunch box is empty when it comes home. Veggies and hummus, PB and pretzels, fruit (always). Ham and cheese roll ups. Wraps cut into pinwheels and pasta salad are great ways to get more veggies in their meals. Usually a sandwich or wrap of some kind. (Turkey, chicken salad, tuna) Or yogurt or a cheese stick. And always fruits and veggies to go along with it! Always looking for new ideas for lunches. Thanks for the inspiration! We tend to pack peanut butter and honey sandwiches, string cheese/yogurt and a fruit. Some of my son’s favorites are: apples, cheddar babybel cheeses, salami, cut up chicken pieces, hummus & pita bread, applesauce, yogurt mixed with fresh fruit, homemade trail mix (dried fruit, cheeriors etc…), leftover black bean “dip” from taco night wrapped in a tortilla shell, and sunbutter and jelly. I love to pack a snack lunch- salami, cheese, crackers, hard boiled egg and seasonal fruit and veggie. Easy-peasy! My daughter loves what we call peanut butter burritos. PB spread on a tortilla, topped with bananas and strawberries. Roll it up like a burrito. Usually have a cheese stick and carrots with it. I like to eat it for breakfast. Meat roll-ups with cream cheese. Fruit, nuts, mini-brie bites. All are favorites. I love your posts. And love all of your ideas for easy lunches. This is my first school year packing lunch for my daughter (although I’ve packed plenty for myself!). I love leftovers, but I’m looking forward to making bento boxes for my girl – we love YoKids yogurt tubes, cheese sticks, and lots of fruits and veggies! I love to pack “ants on a log” (celery sticks with peanut butter and raisins on top the peanut butter), whole grain bread pb &J with organic peanut butter, fresh fruit (grapes, cut up kiwi, strawberries, blueberries or orange), some peas (he eats them just thawed from freezer cold!! (bonus!) , a sweet treat (homemade fruit pizza or graham crackers or a cookie (oatmeal or choc. chip), sometimes we add a healthier type chip…corn chip or blue corn. “-) Drink is usually water or an organic fruit juice…he likes milk only occasionally, so we are finding ways to work milk into his diet in subtle ways. He does like organic chocolate milk…for a really fun lunch, we have packed mini subs where he picks all the fixins and it must contain 5 differnt colors (green for lettuce, red for a bell pepper, yellow for yellow bell pepper, brown for bean sprouts and orange for the cut up steak tomatoes! My son goes to a nut free school and I always pack his lunch. We do a lot of leftovers or sandwiches with fruit. He loves plain greek yogurt and honey as a dessert. We are big on sliced veggies with hummus for dipping! Kabobs! Ham and cheese or fruit, always a hit in our house! I make bento boxes and try to make it fun for my picky eaters. They love showing off their lunch to their friends and they like helping me make them the night before. Roll ups and anything in a stick is a favorite. Favorites include: ravioli, mini corn muffins with Applegate turkey dogs, turkey and cheese roll-ups, lots of fruit, Pop Chips or Pirates Booty and always TWO Stonyfield yogurt squeezers! DIY rice cake open face with hummus and tiny veggie sprinkle on toppings such as broccoli, carrots,tomatoes and peppers. This will be the first year that I am packing for my son. I hope to find things that I can pack for both of us instead of packing two different lunches. My like lots of different things in their lunches, so variety from week-to-week is key. They also like things that are easy/quick for them to eat. I find when I make it fun, balanced and bite-sized, there tends to be less uneaten food at the end of the day. fruit, whole grain bread, yogurt and pretzels! Caprese salad, crackers and fruit salad is our go-to favorite lunch this summer. I like to pack my daughters fresh fruits, mini muffins, and lunch notes telling them how we love them! I like to pack leftovers (need to buy Bentos!) with a fruit and yogurt. I like to pack cheese sticks, crackers and fruit. My daughter loves peanut butter protein balls in her lunch box with a small apple and carrots! My son loves noodle soup in his wide mouth Thermos. Hummus wraps with shredded carrots are also a favorite. I roll up a few at a time, so that some mornings are grab and go. My son likes peanut butter and banana sandwiches on whole wheat bread with veggies and hummus. Love your blog for the helpful tips and yummy recipes! Hummus and veggies are a big lunch time hit! Today, my daughter has rice with broccoli, chicken, and soy sauce in a thermos. She also has blueberry applesauce. For snack, she has a bag of popcorn and string cheese. She also loves, black beans and rice, quesadillas, pizza, apple butter and cream cheese sandwiches, grilled cheese, ham and cheese with crackers, leftover roast pork or rotisserie chicken. For fruit, she might take apple slices, peach slices, or applesauce. My kids love leftover homemade pizza and bean burritos. I also like to make “fudge balls” (homemade Larabars in ball form). Hummus, pita bread cut into strips, and fruit. My kids love sushi peanut butter and jelly, or anything served bite sixed on a tooth stick. Anything they can assemble is a hit! Pizzas, burritos, or homemade “lunchables”. My tween daughters’ love smoothies, hummus and pita crackers and fruit. My kindergarten loves natural PB and whole wheat crackers and pears. Muly kiddo loves homemade cheeseburger or pizza pockets. While I don’t currently back a lunch, my son will start kindergarten next year and I have already started researching ways to pack a healthy lunch in sustainable containers. We have worked hard over the last year and a half to change the way we eat and I am looking forward to continuing that into his school lunch. We already have a Bento Box on his Amazon list and I just recently ordered some Bees Wraps to test out!Both of my kids also eat StonyField yogurt, so the coupons would be great! This giveaway would be the perfect addition. BTW- I love the idea of the (Re)zip Reusable bags! My 1st child will be in kindergarten this year so it will be my first time packing a lunch for her. Loving all these ideas! Sandwiches but my son hates the crust so I bought a bunch of cookie cutters in different shapes. My son will be eating lunch at school for the first time this year for first grade…he loves homemade “lunchables” of crackers, meet, and cheese so I will be sending a lot of that I’m sure! I love packing fruits and veggies for my little one to enjoy at lunchtime!! I always pack turkey and cheese sandwiches on white wheat bread – they’re a guaranteed crowd pleaser in my house. We love cucumber slices, grape tomatoes, fruit, and peanut or almond butter sandwiches. My kids love to have apples and nut butter or hummus and Pitas in their lunch. Thanks for the neat giveaway. Such great ideas from these fellow readers!! I’m totally stealing some of these for days my brain is frozen for ideas. My oldest likes cold pizza that I make with mushrooms and olives. The youngest likes ham roll- ups. Fruit is always a side item for both. I do not like to pack too much as they do not have time to eat a lot and get overwhelmed with a lot of food. Bamboo Lane Crunchy Rice Rollers are a great alternative to chips. I love to pack fresh veggies and fruit from the garden as long as we can. We have a longer growing season which is nice. I also love to pack nuts and dehyrdated fruits (that I dehydrate myself). We pack a lot of snack sea weed and pumpkin muffins along with plenty of organic fruit & veggies. I like to pack finger foods: whole wheat crackers and protein, usually cheese or a nut butter, sliced fruits and veggies, and sometimes a treat, a fruit leather or granola bar. Strawberries and carrots with hummus. My kids love homemade muffins or leftovers from the night before, reheated and put in a thermos. My girls love when I pack soup in their thermos to break up the regular “cold” lunch routine. sandwiches, veggies, fruit, leftovers…whatever I can think of or have on hand. Packing lunches for four very different eaters isn’t always easy! I love packing anything I’ve prepped beforehand – cut veggies, energy bites, mini beet chocolate muffins, cut fruit, etc. My kids love several different things in their lunches. I often pack my son a container of Greek yogurt sweetened with honey or maple syrup. He eats it like a dip for crackers and fresh fruit. Sometimes instead of dipping, he’ll mix the fruit in the yogurt, crumble the crackers in it, and call it a parfait. I’ve won just by getting all of these great lunch ideas! My son has two favorites, Mac and cheese and cooked chicken. By themselves they aren’t anything special…but the fact that he eats it all and tells me they were still warm when he opens the containers at lunch is always a small victory, making them the best thing I pack! We are trying to get our first grader involved in packing his own lunch. Unfortunately that means he wants everything cheese – cream cheese sandwich, string cheese, Babybel cheese, Laughing Cow cheese and…. oh, a yogurt!! Have to start somewhere though. I’ll have to show him your blog! turkey and cream cheese roll-ups!! My favorite thing to pack is homemade soup! Such a yummy, hearty lunch!! I have two teenage stepchildren for whom it is a struggle to find something they like. Winners include soup like chicken noodle soup in a Thermos, tortilla wraps, and salads. My stepdaughter in particular really enjoys taking a salad to school. It is helpful to have small containers or containers with separate compartments for dressing, croutons, etc. to prevent the lettuce from getting soggy. Favorites in our house include a variety of fruit and veggies, cheese sticks and egg salad. i love packing leftover taco salad for my girls; they eat something they love and it has lots of veggies. I like to pack salami, cheese, crackers, pickles & olives in my son’s lunch. My son loves carrots with guacamole and homemade “lunchables” with whole grain crackers and applegate ham/cheese. He also loves a good salad! Hummus, cheese and cucumber sandwiches – so quick, easy and nutritious! My kiddo loves veggie sticks with pb! Plain yogurt with frozen blueberries and a little pure maple syrup and a dash of vanilla. Doesn’t have as much sugar and no artificial colors. Well, I’m just starting to pack lunches this year, so don’t have favorites yet … But some go-to food that I’m planning to pack includes berries, sliced cheese, and mini sandwiches. My son loves turkey and cheese wraps! Fun & varied stuff… cheese sticks or Babybel, mandarin oranges, deviled eggs, etc. Grapes are always a go to for lunches! We always pack some kind of sandwich with a vegetable and fruit with milk. My kids love ham and cheese kabobs, snap peas ad apples. Wraps with lunchmeat,avocado and a greek yogurt spread. My kids call them “turkey tacos”, but really the only thing they have in common with a taco is the tortilla! I try to pack Bento lunch style. Cheese, fruit, veggies, also they love Guacamole and tortilla chips. Some stores have the individual cups of Guac. Great giveaway! I always pack two fruits and two veggies, depending on the season. Hummus and/or guacamole. Then if we have them, leftovers in a thermos. Homemade muffin or protein balls. I use Yumbox boxes and love to pack fresh fruit, veggies, healthy options for my two elementary kids. Their favorite is tuna, crackers, cheese, grapes, frozen peas! I like to pack homemade lunchables. My son eats a lot of the same foods everyday only this year i am going to start packing him almonds. His typical lunch is ham sandwich, cheese stick, nutrition bar, crackers, strawberries and water. Sometimes I will add in a cookie 🙂 thank you for the giveaway opportunity Sally! My daughter loves cream cheese and jelly sandwiches cut into a fun shape with a cookie cutter. My son loves salami and cheese! I love to pack rolled up ham with cream cheese an lettuce. They look like taquitos and the kids love them. I was always so reticent to try seaweed (and it took a few tries!) but now my kids and I love it both as a snack and as part of a lunch. I am excited to start the school year off with something new in our rotation!. I love packing edamame in my daughters lunch. It’s another vegetable that she enjoys and it is super easy to pack. I like to pack seasonal fresh fruit in school lunches! I have a very picky eater, so we o a lot of yogurt and plain bagels and fruit. He eats it all, so that’s something! Fruit! and an occasional surprise treat! My 3 year old doesn’t need a lunchbox yet but I would definitely pack hummus, carrots, and chips. Just about the healthiest thing she wllingly eats! Since my kids know in a Dietitian they also know lunch is a wide variety of healthy foods. We always pack the Myplate food groups with a water bottle! My kids love make your tacos for lunch- individual Holy Guacamole packs, small flour tortillas, cheese, and tomatoes with or without any leftover taco chicken or meat I might have on hand. I like to pack hummus and pretzels. They love to dip and will lick the tupperware clean! My kids love it when I have some homemade muffins to pack in their lunchboxes! Always try to include fresh fruit! Yogurt, granola, and fresh fruit! My kids love turkey, grapes & carrot sticks, i try to mix things up but this is the fav. Love all the great ideas here! My daughter started middle school cross country this year followed up with basketball practice. We have to pack snacks that have protein to get her through the day. She loves Justin’s butter packs wth a gala Apple for her first snack. Lunch is usually leftovers from the night before. It can range from tortellini with chicken or ground elk to pork tenderloin with a small salad. (She loves grape tomatoes). If we are in a pinch ham, cheese, green apple and apricot spread wraps make the cut. I try to have packets of homemade frozen chicken noodle soup for the days we don’t have leftovers. I can heat those and put in a thermos and they will stay warm until lunch. Afternoon snacks range from baybel or string cheese with almonds. She loves to freeze dole sugar free fruit cups in the warmer months to eat after practice when she is hot. We aren’t perfect someone days it is homemade granola mix with regular m&m’s, peanuts, toasted coconut, and dried banana chips. I would rather throw in treats occasionally than have her choose the vending machine. Homemade nut-free granola bars as a snack and MYO pizzas w/ mini whole wheat crusts and containers of pizza sauce, cheese and olives. Favorites! I like to send sunbutter ‘sandwich’ (on a tortilla), with raisins and baby carrots or bell pepper sticks. I love packing leftovers, soups that I make and freeze, and homemade uncrustables that I freeze as well. I pack in lots of fruits and veggies and rotate it up so they get a variety of nutrients and it keeps their taste buds happy! Incredibly, I have two (of three) who will gobble up the cooked leftover veggies from last nights dinner in the next day’s lunch. It’s great! Not that they won’t eat anything remotely sweet first, but it’s nice to know I can get the vegetables into them as well. I love to cut sandwiches into a heart shape for my 6 year old! My daughter loves when we pack mini make your own pizzas. Also loves when we pack watermelon! I love using EasyLunchboxes to pack for me and my kids! I sometimes make little kabobs, layering meat, cheese and cherry tomatoes on a stick for my son. Thanks for all of your great tips! I let my girls make homemade trail mix and they love to pack it in their lunches! My kiddos will have PB & J forever I think:) They also love frozen yogurt tubes. My son loves fresh cheese curds and cantalope in his lunch! My soon-to-be Kindergartener loves peanut butter and banana roll-ups! Dates and cheese bites are also popular with raw veggies on the side. I love to pack fresh fruit, turkey rollups, carrots, and yogurt for my kids! Carrots, roll up sandwhich and strawberries are my son favorites! This will be my first year packing lunch as my daughter starts First Grade tomorrow! I am excited to put kabobs in her lunch because she loves them. Thanks for your wonderful tips. Whole wheat tortilla sandwich wraps. Nuts with dried fruit, noodles with pesto ( tastes great cold), peanut Butter and celery, sugar snap peas, frozen blueberries (ready to eat by lunch), homemade muffins. I love reading all of the comments. My daughter loves taking soups and leftover dinners. Winning this would make it a lot easier to pack good lunches. Thanks for all of your advice. I love to pack everything that is not a sandwich. I usually send the leftovers, yesterday they had mexican lasagna, but if there is no food left or if I didn’t cook I send them pinwheels, or homemade lunchables with crackers, turkey breast, cheese and a fruit. My kid’s favorites are pasta’s in thermos or quesadillas! I love sharing your blog with my daycare parents they are always asking me for advise on what to send! I like to pack fruit, veggies, hummus, deli meat, hard boiled eggs, etc. Anything that is healthy and will stay fresh, These containers would be great! I would like to pack healthy tortilla roll ups with different variations! One day it could be a chicken Caesar one and another day it could be a turkey club! Mini Egg frittata’s- Blend cooked oats with sauteed veggies in the food processor, bake to form a crust. Then pour in the eggs and top with cheese 🙂 Bake until eggs set, so easy to pack for lunches! I love packing fresh fruit and veggies with some sort of protein to get them through the day. My goal this year is to try to be more diverse and not pack the same thing everyday! My daughter loves mini pizzas – whole wheat crackers, turkey peperoni, and cheese. Add them to a bento box with some fresh veggies and she will be a happy camper. My oldest starts kindergarten next week! His current favorite food is raw sweet pepper so I’m sure that will be a regular staple. My daughter loves fruit. So I usually try and pack some kind of fruit whenever we got out for the day. Pumpkin pancakes with chocolate chips spread with peanut butter! My kids don’t like sandwiches but they like these! I just got some of those upon serve containers and two should fit perfectly in there! I like to pack a cheese sandwich and grapes. Fruit, string cheese, or homemade applesauce. I just love all of the ideas on your website!!! My daughter loves the lunches I pack. Thank you for helping me be creative and healthy. I like to pack sandwiches with a fruit and a little “sweet treat” – but most important is the occasional “mommy memo” to say how much I love them and wish them a GREAT day! I lIke to pack hummus in my kids’ lunches. They dip pretzles and veggies in it. Since they don’t really like meat, it’s a great way to get some protein in the lunchbox. Turkey sandwiches and dipping veggies! My girls love it when I pack pasta salad for lunch. Pretty much just bow tie pasta with cucumbers and tomatoes with balsamic salad dressing. My kids love shrimp pasta salad!!! I like to pack in my kids lunches fresh fruit and vegetables. Last year I packed a petty lame lunch..(sandwich, chips, desert, drink) I’m actually really looking forward to parking a well balanced and healthy lunch for my kiddos!! My son’s favorite is garden pasta with pesto or Italian dressing. In a pinch, it’ll go in my lunch, too! We’ve been using Easy Lunch Boxes for 4 years now and LOVE them! I usually pack in my daughter’s lunch: peanut butter sandwich on whole grain bread or cheese and whole grain crackers, a fruit and/or veggie, and a gogurt. Sometimes I will put a little treat in there for her. I also like to write little notes to her on the napkin I put in her lunch. I pack a lunchbox daily for 4 kids! I pack macaroni and cheese, pb&j, chicken breast, salads, lots of fruit etc! I appreciate all you post and I get ideas daily from you! I want to win!!! Thank you! This is awesome! This will be my son’s first year taking sack lunches. He is excited to be able to assist in choosing his lunch. This is so helpful. My favorite thing to pack in my kiddos’ lunch is a note to encourage them about their day and to let them know I love them. 🙂 A quick protein item we do is a salami roll: cream cheese on a thin slice of salami. My oldest loves his salads along with some fruit and chips. My youngest likes to make his own lunchables in the different sections. And now my husband who started working nights likes packing dinner leftovers and sneaks some of the kids cookies in the medium section. Love reading the comments for new lunch ideas too – thanks! I pack 4 lunches and 4 snacks every night. Fun containers definitely help the process. Frozen smoothies in squooshi pouches might be my most favorite thing to throw in– fruit, veggies and an ice pack all in one! I will make crescent rolls with cheese and pepperoni in them. I pack my son a sandwich/bean burrito/hummus & veggies and a juice/water. Other things I include are things such as fruit, yogurt, healthy snack and sometimes chips or a treat! My daughter starts Pre-K in September and this will be her first time packing a lunch for school! I’m guessing that cheese sticks, fresh fruit and vegetables will be among her favorites though! Kieffer pears ripe off the tree. A slice of my crab apple pie. Cheese, sandwiches vary depending on what I’m cooking. Boxes of raisins. Sometimes it is leftovers of something they loved and works cold and keeps well. It really depends on what is in season at the time. Rainbow baby carrots are my favorite veggie to pack them! Dried fruit usually gets added as their dessert. Our lunches vary every day around here, but I always pack them bento style so there’s variety. Currently, my son is on a nutella kick, so I started packing him a tortilla with a banana and nutella rolled up and sliced into bites. Not the healthiest choice, but I always include other healthy items and besides, he’ll move on to something else soon. We make a bunch of burritos and freeze them. Then they can be heated up as needed. Leftovers!! I love packing dinner leftovers in their thermos. Their favorite is red beans and rice. Hummus and veggies or pretzels are a favorite, and a new favorite is sprouted grain tortilla roll ups! 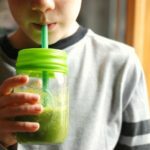 My son has a special diet, and i recently found out about his food allergies. I usually always pack him a sandwhich, on gluten-free bread. Whether it be grilled cheese (with bacon or tomatoe) or a jelly sandwhich. I always try to include fruit and veggies as well. His favorite: tomatoes and blueberries. Turkey roll ups, fresh fruit or applesauce and a love note from Mom! My daughter loves fruit and strawberry jelly flower sandwiches! Cottage cheese and strawberries are the favorites with my kids. I like to pack a variety of seasonal fruit and vegetables every day. My daughter loves notes in her lunch and fruits and veggies best with ranch. My kids often like homemade Lunchables or homemade soup in a thermos from last night’s supper! My son loves when I pack him cheese, any kind!! And my daughter likes to mix different things and make her own trail mix!! My daughter loves when I pack sliced apples. She also loves peanut butter sandwiches. I like leftovers combined with black beans. Quesadillas are good too. All the fixings to make tacos, both my girls love them! Cheese chunks or string cheese, fruit slices, and granola clusters are some favorites. I love to include Greek yogurt in my kids’ lunches. My kids love zucchini muffins, chunks of cheese, grapes, apples, carrot & celery slices with my homemade hummus and pretzels. They would love it if I could squeeze in an entire chocolate cake with vanilla ice cream, but that’s not happening. Love notes make their day too!! Thanks for the opportunity to win! My kids love chili and soup. Tuna in a wrap, tomatoes and cucumbers. Love to pack homemade mini muffins! They’re cute, perfect for little hands and a way to show love in something homemade. My son likes when I pack the “homemade” lunchables. I cut up meat and cheese small with the crackers. Usually a fruit too. My son loves Madras Lentils in his thermos. I also like to pack applesauce, popcorn, fruit and sometimes turkey. My son also likes tuna sandwiches. Peanut butter and banana tortilla roll-ups, cucumbers, grape tomatoes, and carrots with hummus. Wow! Reading the comments for ideas, my son starts kindergarten in two weeks and until now we’ve had lunch provided by the daycare. Homemade lunchables, veggies and dip, fruit, muffins, popcorn are my kiddos favorite things! We’re in a bit of a rut (yes, already – school started for us Aug 1). Kids generally get choice of PBJ or meat and cheese sandwich, or chips and cheese with yogurt. I don’t always manage it, but I like to put in something to surprise them – a joke, a fortune cookie, maybe a kiss. Would love to win. Love making lunches!!! boiled eggs are a favorite! I love to pack tomatoes and cucumbers. The kids love their veggies. veggies and fruit, sandwiches, crackers and cheese and lots of water! My daughter, whose a picky eater, loves fresh fruit, carrots, and a PB & j sandwich ( or ham rolls) in her lunch. I would love to enter! I love to pack apples. I like packing yogurt and fresh fruit in my boys lunches. In the winter they like hot homemade Mac and cheese or chicken soup in their thermos containers. I put egg salad sandwiches in my boys’ lunches because they love them! Otherwise it’s ham and smoked Gouda and lettuce for one and hummus, smoked Gouda and tomato for the other. I give them carrots or edamame with it but I need to find other kid friendly veggies to put in as well. Of course their favorite is when they got a slice of your fudgy zucchini bread for a treat!! My son loves when I pack a “fun lunch” of a banana or zucchini muffin, yogurt, and cut-up fruits and veggies! I try to make sure there’s usually a fruit and veggie, dairy (often yogurt), and I like to try new carb/meat combinations, but my son is stuck on Nutella and jelly sandwiches lately. I’d like to try wraps, pita sandwiches, etc., but he doesn’t want those yet. =) Looking forward to browsing through your ideas to help give us more choices! My daughter’s favorite is mini meatballs & no matter what else he packs, my son always, always has hummus and pita chips/carrots.I love getting all these lunch ideas! I like to pack celery sticks filled with peanut butter. Also Ritz Bits are a favorite! I like to pack cucumbers, carrots sticks and usually cheese of some sort. My kids pack their own lunches using a chart that I made. There are 5 columns: Main Event (sandwich, make your own lunchabale, cereal, leftovers), Fruit, Veg, Drink and Treat (yogurt, pudding, goldfish crackers or popcorn). They have to include one item from each column. We made the chart together so I know it includes things they will enjoy but that are mom-approved. 🙂 Of course I always stick a note in there. We also like to do lunchbox meal planning. Every Sunday afternoon I give them each 5 gallon sized ziploc bags numbered 1-5 with their names on them. Their lunches are packed into these bags and then stored in the fridge. Each morning all they have to do is grab a bag out and tuck it into their lunchbox. My 2 & 4 year old both like edemame. They will also eat just about anything in a wrap if I cut it in half and put a fancy toothpick in it once it is wrapped up, so that is how I get them to try new things! My sons favorite is always apples! This is my last year of packing lunches.. My “baby” is a senior and I’ve packed 1000s over the years. My friends ask why I pack lunch for an “adult” but it’s to remind her everyday when she opens her bag that I love her and I’m thinking about her! I like to pack whatever makes her smile… She’s into cold soba noodle salads right now so I’m sure I will pack those! Okay, so I don’t have kids (but still love your blog! ), but I always try to pack easy grab-n-go snacks in my lunch, like apples, grapes,yogurt, and nut butter packs! Thanks Sally! My daughter like hot foods, with one of her favorites being leftover pasta figioli. Love mini-quesadillas in my kids’ lunches! I like to pack carrot and celery sticks with hummus which I put in a mini Tupperware container. I like to make chicken salad with chicken breast, sautéed spinach, garlic, and kale. I use yogurt instead of mayo and my very picky stepdaughter loves it. I usually pack it with vegetable rounds and whole grain crackers. My daughter starts pre-K in two weeks so technically I haven’t actually made a lunch yet but super excited to make sandwiches in cute shapes!! My daughter loves seaweed snacks! My kids like homemade sushi in there lunch. I like to pack apple and peanut butter “sandwiches”, cottage cheese with fruit, mini muffins, and waffles with cream cheese. Reading through everyone’s comments has given me lots of new ideas for lunch!! I get into such a rut so early in the school year. My daughter loves to eat leftovers for lunch. Stews, soups or chili in her insulated jar. Sometimes she take taco meat and pack the lettuce and salsa in containers and assemble them in school. I try to keep a variety of food in mason jars in the freezer so she can easily heat them up to pack. My son prefers rolled up meat, cheese and crackers with sugar snap peas or peppers. My kids love it when I pack black olives in their lunch. I also like to surprise them with a note. I haven’t packed any school lunches yet – my six year old starts first grade (and full day) this year. Peanut butter is out, and she’s fairly picky, so I’m struggling to come up with ideas. But I’ve seen others use mini bagels and I think she’d really like that. Applesauce, yogurt, cheese and crackers, and fruit! Cucumbers and hummus is one of my favorite things to do for my son! I like to pack dried fruits and yogurt in their lunches. Chicken and broccoli and carrots. I like to pack homemade “lunchables” using good meats like Applegates sliced meat and organic crackers. I also like to send Stonyfield yogurt tubes and some fresh fruits and veggies. I like to pack celery sticks with peanut butter and raisins on top for a fun snack. When my boys 1st started school they would buy a school lunch, wanted to be like the other kids. But very soon they were coming home starving because honestly the school lunches were a joke. So they were very happy for a “mom” packed lunch. They always had fruits & veggies besides the main item like soup or a sandwich. I loved making their lunches because it let me be a part of their day & they loved the surprises I would sometimes leave, like a mini candy bar or an extra cookie. It made them feel just a lil extra special that day. Sometimes a lunch can be so much more than just a lunch. Hummus with pita and carrot sticks. I like to pack sushi in my sons lunch! I love to pack trail mix and fruits and vegetables. 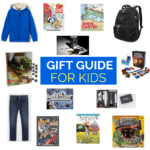 My kids favorites to pack are pretzels, yogurts, and cheese sticks! First year packing lunches for my son, loved reading all the great ideas. Pretty sure a turkey sandwich, fruit and a snack will be a staple lunch for him! Would love a chance at all this awesome items! This is the first time that I will be packing lunch for my daughter. I will probably pack lots of leftovers from dinner, sandwiches, fruits, veggies, cheese, crackers, hummus, turkey, and pasta. An easy lunch I pack is a whole grain pita sandwich w/hummus or deli meat, a veggie, and fruit + water bottle. We always pack a fruit plus veggies and dip! The rest changes upon mood! I feel lucky that I’m late to the game bc I now have such a groovy list of ideas! I keep both girlies here away from gluten and dairy whenever I can.. we enjoy berry tosses-strawberries, blackberries, raspberries and blueberries…they always look so appealing..celery with dip…homemade chocolate chip banana bread mini muffins….hardboiled eggs for sure! Good luck with back to school everyone! My kiddo doesn’t like his food to touch, so I tend to pack individual portions like berries, a whole piece of fruit or something that wont leak. he also isn’t keen on bread so his meet and cheese or protein is usually bread free! My 3-year-old loves when I pack rolled-up turkey slices in lettuce wraps. Whole wheat mini bagels make a nice change from sandwiches. I like to pack cheese cubes, turkey cubes, carrots, cucumbers and fruit. Lots of little things for little hands. I like to make apple sandwiches for my kids with peanut butter in the middle! I love to pack healthy muffins. Right now they are loving zucchini and your oatmeal/pb/banana/Chico chip ones. I make them on the weekend and freeze. I put them in the lunch pack frozen so they help keep other food cool and are thawed by lunch!